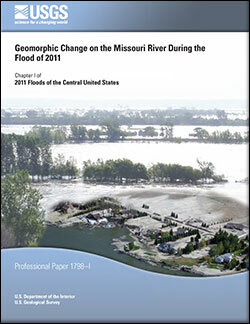 The 2011 flood on the Missouri River was one of the largest floods since the river became regulated by a series of high dams in the mid-20th century (greater than 150,000 cubic feet per second during the peak). The flood persisted through most of the summer, eroding river banks, adding sand to sandbars, and moving the thalweg of the channel in many places. The U.S. Geological Survey monitored and assessed the changes in two reaches of the Missouri River: the Garrison Reach in North Dakota, bounded by the Garrison Dam and the Lake Oahe Reservoir, and the Recreational Reach along the boundary of South Dakota and Nebraska bounded upstream by the Gavins Point Dam and extending downstream from Ponca, Nebraska. Historical cross-section data from the Garrison Dam closure until immediately before the flood indicate that the upper reaches of the river near the dam experienced rapid erosion, channel incision, and island/sandbar loss following the dam closure. The erosion, incision, and land loss lessened with time. Conversely, the lower reach near the Lake Oahe Reservoir slackwaters became depositional with channel in-filling and sandbar growth through time as the flow slowed upon reaching the reservoir. Preliminary post-flood results in the Garrison Reach indicate that the main channel has deepened at most cross-sections whereas sandbars and islands have grown vertically. Sandbars and the thalweg migrated within the Recreational Reach, however net scouring and aggradation was minimal. Changes in the two-dimensional area of sandbars and islands are still being assessed using high-resolution satellite imagery. A sediment balance can be constructed for the Garrison Reach using cross-sections, bathymetric data, sand traps for wind-blown material, a quasi-three-dimensional numerical model, and dating of sediment cores. Data collection and analysis for a reach-scale sediment balance and a concurrent analysis of the effects of riparian and island vegetation on sediment deposition currently (2014) is ongoing. Schenk, E.R., Skalak, K.J., Benthem, A.J., Dietsch, B.J., Woodward, B.K., Wiche, G.J., Galloway, J.M., Nustad, R.A., and Hupp, C.R., 2014, Geomorphic change on the Missouri River during the flood of 2011: U.S. Geological Survey Professional Paper 1798–I, 25 p., https://dx.doi.org/10.3133/pp1798I.